The Church of Our Lady the Queen of Poland,Świdnica (Lower Silesian voivodship) image credit:Igor Snopek, from Architecture of the VII Day byKuba Snopek, Iza Cichonska, Karolina Popera (2015). With its new season including an exhibition, conferences, series of lectures and much more, Calvert 22 Foundation is planning to explore public spaces designed with a Soviet utopian ideology in mind, and their relation to power. 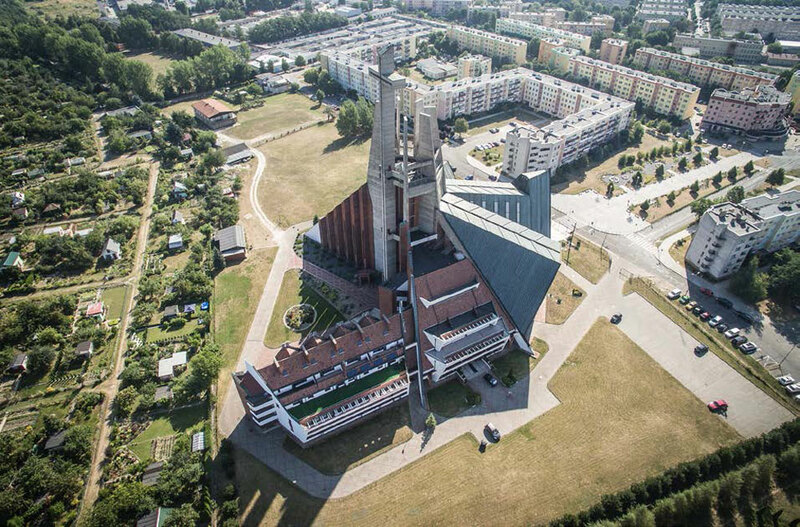 Courtesy of the artistThe Church of Our Lady the Queen of Poland,\nu015awidnica (Lower Silesian voivodship), by Igor Snopek, from Architecture of the VII Day by Kuba Snopek, Iza Cichonska, Karolina Popera (2015). Courtesy of the artistDmitry Lookianov, Image from the Instant Tomorrow\nseries (2013-15). Courtesy of the artistVahram Aghasyan, from the Ghost City series (2005-07). Fresh from the success of its last project, Red Africa, which concentrated on people and on relations between Soviet Union and Soviet authorities with African countries, the London-based Calvert 22 Foundation is launching a new season. The new season, Power and Architecture, which opens on June 10, is also devoted to power. But these time the organizers are looking from the perspective of buildings, not people. “Comprised of four interlinked elements, the season will examine the relationship between architecture and power by investigating public spaces designed with a Soviet utopian ideology in mind, the people who live with its legacy and the search for new national identities within a post-Soviet world,” said the press-service of Calvert 22. A two-day conference titled “The Centre Cannot Hold?” is the first major event in the program of the new season, and will take place on June 10 and 11. Michał Murawski and Jonathan Bach from the Fringe research center at University College London will lead the discussion, which will focus on the esthetics, politics, economics and effects of centrality and monumentality in 20th century cities. The line-up includes contributions from prominent researchers, architects and artists. From June 12 to October 9 Londoners will be able to see the exhibition “Power and Architecture,” devoted to multiple aspects of relations between these two issues. “From the gothic might of Stalin’s seven Vysotki to Astana’s gleaming Bayterek Tower, giant structures loom over the citizens of the former Soviet Union, signifying the grand ambitions of their rulers, past and present,” said the organizers. Calvert 22 Foundation sees its mission “to support and share the contemporary culture and creativity of the new east – Eastern Europe, the Balkans, Russia and Central Asia,” so many of the items on show will be devoted to the post-Soviet world. The exhibition program will consist of four parts, bringing together photographers from this “New East.” Read more about each section and a list of artists here: calvert22.org. Details and further information are still to be announced, but what is known for sure is that the events will connect architects, designers and creative technologists from Prague’s reSITE organization, whose aim is to “protect and promote public space, architecture, and sustainable development in cities,” and London’s Museum of Architecture and Assemble collective. A digital part of the Calvert’s new season will be hosted of course by Calvert Journal, which describes itself as “a guide to the New East.” The people at calvertjournal.com will be publishing reports, essays and photo stories (in the creative style they always have) giving a wider picture of the relationship between power and architecture in the post-Soviet world. 'Power and architecture' season: June 10 - October 9, for more information visit calvert22.org.